Calc is a little byproduct of Plot. It is mainly the builtin calculator of Plot as standalone application. Calc is easy to use, just enter your calculation in the lower text field and hit return to get the result in the upper textfield. The result of every calculation is stored in a variable (r0 ... r<n>). These variables can be used in later calculation. 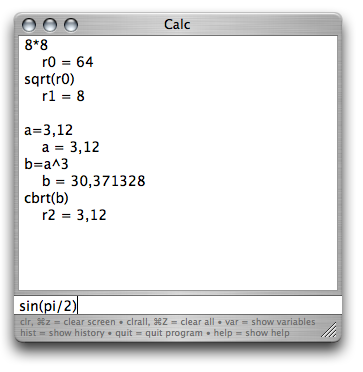 The Arrow-Up and Arrow-Down keys allows you to browse through calculation history. clr reset the calculator and deletes all variables and the history but not the user variables. clrall reset the calculator and deletes all variables and the history.